No worries, I won’t take my sweet time to divulge it. The secret ingredient in the meatballs is… rolled oats! And, I have one word for you: WOW! I loved their texture and taste, no way you can detect oats in them (not that there’s anything wrong with it… ;-)). They are soft and tender, very light and flavorful. The meat? Ground turkey, white meat only, not the mixture of 50/50 white and dark I normally go for. Ginger and lime tie it all together. Smoked paprika adds some warmth. Place the ground turkey in a large bowl. Make a well in the center, then add all other ingredients. Mix well with your hands, but do not squeeze the meat too much. With wet hands, form large balls and place them in a muffin tin or on a roasting pan covered with parchment paper. Brush the surface with a little ketchup, if you want. Cook the meatballs in a 375 F oven for about 30 minutes, turning them midway through cooking time and brushing the top again with ketchup. Serve them right away, or simmer gently in the sauce of your choice for 10 minutes. I must thank my niece Raquel who raved about meatballs with oats and urged me to make them. A softer texture than breadcrumbs, they end up more like the traditional meatballs prepared with bread soaked in milk. But, of course, considerably lighter in terms of calories. Next I will be adding rolled oats to my meatloaf, I bet it will be equally awesome! And, by the way, feel free to add onions and garlic to your meatballs, by now those who follow my blog know that we use those ingredients sparingly. Ginger and lime go so well together… Love them! What a clever idea! I’m not a big meatball eater, but I will pass this along to my mom for sure. She and my dad enjoy meatballs and meatloaf. I’m curious about the orange zest added to the tomato sauce. That sounds interesting to me. 🙂 And I do like the sound of ginger, lime and smoke paprika. Yum! I love the Asian flavors in these. Never tried oats; I usually use Panko. I like to use Panko too, better than bread crumbs (the regular kind, that is). The quick oats make them very smooth, though. Your combination of seasonings sounds wonderful, Sally. Since I developed an allergy to wheat, I’ve used rolled oats in meatloaf for years. I soak the oats in a bowl in the fridge mixed with soy sour cream and an egg and they work great. Everyone loves it but I only make it once or twice a year now. You, Cindy, and Heather! The three of you have been using oats but I don’t think you ever told me 😉 Oh, well – it’s old news for you, but I am glad I found this, better late than never, right? I agree with the clever idea comment. I bought a bag of rolled oats to make Irish soda bread recently and wondered what else I could do with it as I’m not a breakfast eater. Make sure it is quick oats, otherwise it won’t work the same. I am not a breakfast eater either, my oats are usually reserved for breads or something along those lines… and, of course now for meatballs and meatloaves! Hummmmm…. goat meatballs… that sounds very interesting – maybe a little curry sauce to go along? This is very clever, I would never have thought of oats or a muffin tin and I am going to show it to my sister who is always telling me to use turkey mince and I never do, but maybe now is the time to change! I will definitely give this a go, thanks Sally ! 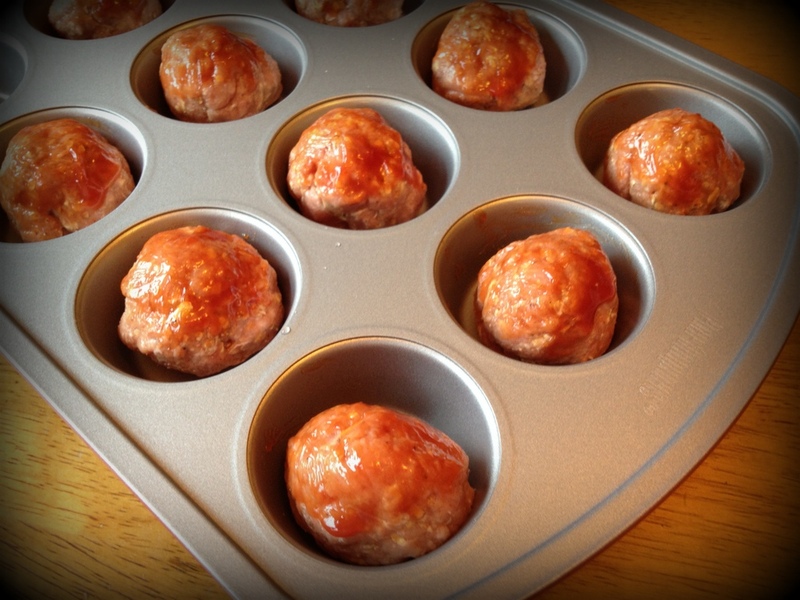 That’s such a great idea putting the meatballs in a muffin tin – I’ve never seen that before! What a fun tip. The rolled oats sound neat too…don’t think I’ve had that in a meatball before – I think as long as the oats are cooked somewhat they end up tender as you say and deliver some nice texture. I had raw oats in a recipe the other day and while I love oats, over time the raw ones started to wear on me (too scratchy). Yummy recipe Sally and some great ideas! :). I haven’t tried oats in meatballs, but they’re great in meatloaf. These look tasty. Very proud that I have inspired you once! Next time I wanna see a cake!